Spacious sunny living room opening onto a veranda overlooking the ocean. 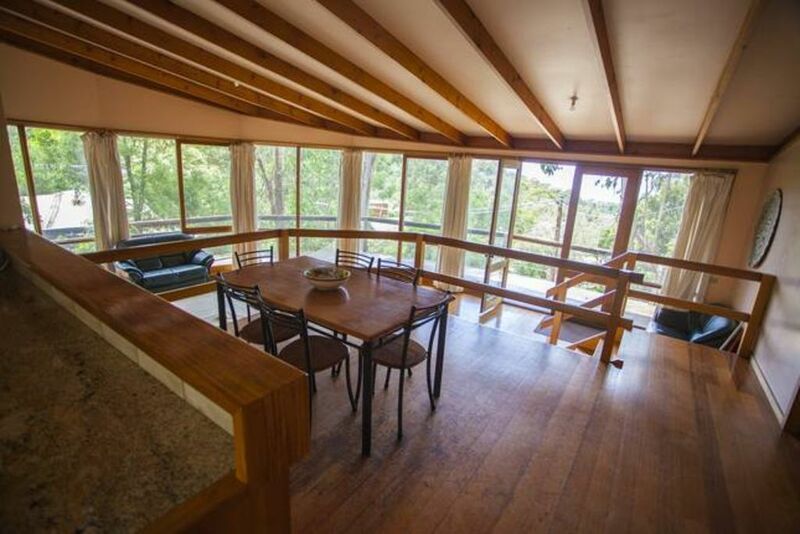 Three bedroom, one bathroom modern passive solar designed home. Refreshing in Summer, and warm and cosy in Winter. Spacious living area with surrounding ocean views. Master bedroom: queen sized bed. Second bedroom: queen sized bed. Third bedroom, one single bed and one bunk bed. There is also a sofa bed in the lounge for extra guests. Please note we do charge $50.00 a night for extra guests above four adults at $50.00 per night. This charge does not apply for children below the age of 14 years so if you are bringing a child who is less than 14 years old please do not include them in the number of guests. Located on a ridge overlooking the Erskine Valley to the ocean. The beach and shops are less than a 10 minute walk through Kia Ora caravan park and the Otway Forest behind the property offers tranquil bush walks and wild life viewing. A quite sheltered part of Lorne to embrace and enjoy the surf coast life style. Swimming, Surfing, Sunbathing, Fishing, Bush walking, Golf, Sightseeing, Shopping, Restaurants and Cafes.